Goalscorer Beth Hepple believes Durham’s attack can continue to cause problems this season after her side recorded their second consecutive win of the FA Women’s Super League 2 campaign. The hosts took a deserved three points against London Bees as goals from Jordan Atkinson and then Hepple herself handed them victory. Forward Nicki Gears was also a threat throughout, hitting the post in the opening minute and then creating the goal for Atkinson, and midfielder Hepple believes all three have hit the ground running. “We have played together last season and we have worked really hard in pre-season and something has just clicked. We know each other a bit better now,” she said. “Nicki and Jordan have got quite a lot of pace so we used that to our advantage. They were playing quite a high line so a lot of the time it was on to play the ball in behind. “I don’t think we played our best football and the conditions weren’t great with the wind but at the end of the day we got the result so we’re happy. “It is very rare that a team plays fantastically every single game so it is important you can ride games out. After hitting the post early, Durham continued to dominate the match with Gears forcing a low save from Sophie Harris before then playing in Atkinson to score on 36 minutes. The Bees, who now have one point from their two games, tried to look for a way back but their task was made harder on 72 minutes when Hepple picked up on a poor kick from Harris to lash home from 30 yards. “I think the slow start was a big factor,” said captain Ashleigh Goddard. “When we are going forward we need more people in the box. “The slow start set us back massively and we needed to overcome that in our heads before actually thinking about changing it. “It took us a bit too long to get into the game. We know it is a learning curve and we need to be sharper from the start. 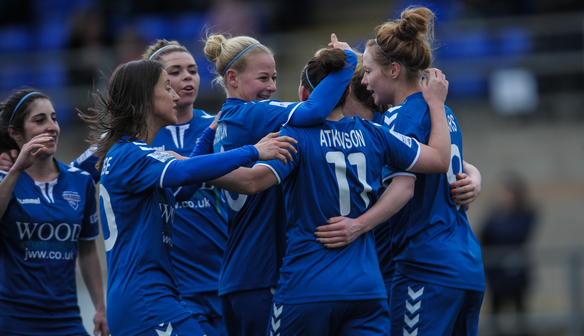 Durham Women FC (4-4-2): Helen Alderson, Chloe Macek, Sarah Wilson (c), Sarah McFadden, Beth Hepple, Nicki Gears, Nat Gutteridge, Jordan Atkinson, Becky Salicki, Ellie Christon, Amelia Pereira. Subs: Sarah Eadon on for Pereira 54, Lauren Jordinson on for McFadden 83, Nicola Gibson on for Christon 88. Subs not used: Sophy Stonehouse, Jess White, Megan Elliott. London Bees (4-4-2): Sophie Harris, Ashleigh Goddard (c), Jade Dempster, Aoife Hurley, Sophie Fogarty, Rebecca Anderson, Emma Beckett, Nicola Watts, Paula Howells, Jo Wilson, Evdokia Popadinova. Subs: Sydney Hinchcliffe on for Howells 61, Merrick Will on for Dempster 72, Danielle Scanlon on for Popadinova 85. Subs not used: Imogen Riches, Danielle Oates, Cheryl Williams, Andria Georgiou.